LYON, France, Aug. 18, 2015 /PRNewswire-USNewswire/ -- The USA's Track & Field team won 57 golds and 160 medals overall at the World Masters Athletics (WMA) Championships just concluded over a two week span in Lyon, France. The American team of 426 also set six world records, four individual and two relays. 8078 athletes from a record 98 countries participated. World marks were broken by Flo Meiler of Shelburne, VT in the W80 Heptathlon as well as the 2000 Steeplechase; Rita Hanscom of San Diego, CA in the W60 Heptathlon; and Kathy Bergen, La Canada, CA, W75 200 meters. In addition, Bergen tied the world mark in the high jump. Christel Donley, Colorado Springs, CO, also broke the W80 heptathlon mark while second to Meiler. In the relays, the USA women's relays team could not be stopped, setting two world marks, in the 4x100 with Chrystel Donley, Flo Meiler, Fei-Mei Chou, and Irene Obera; and in the 4x400 with Chou, Mary Harada, Donley, and Obera. Highlights of the meet, according to USA Masters Chair Gary Snyder, who headed the delegation, and Phil Greenwald, co-team manager with Mary Rosado, included Irene Obera's five golds, two relay golds, and two world record relays; Flo Meiler's six golds with two relays plus two silvers; Rita Hanscom's four individual golds and world mark; and the U.S. relay teams winning nine golds, six silver, four bronze and setting two world records. Other highlights included Bruce McBarnette winning his 12th high jump world title, the most of any high jumper in history; and in the work that few see, Greenwald's administrative expertise in reversing a disqualification of a US hurdler for hitting a hurdle by filling out the form as the flag went up, citing chapter and verse in the rules allowing it if unintentional and providing three separate videotapes proving it was unintentional; Snyder (who also competed) generating a team hotel and continuing his tradition of a team party with hundreds of participants; and USATF Masters Treasurer Carroll Deweese being called on by World Masters Athletics Association President Stan Perkins to make the motion at the WMA meeting for approval of all committee reports. In addition, Snyder thanked USATF for providing, for the first time, free team uniforms to the full world masters team. Other highlights included seeing the return of formerly injured masters athletes again being world stars, including MTF Vice Chair Robert Thomas, who won several medals, proving dedication to the masters mission of lifetime fitness and health through training and competition. Many team members noted the remarkable, supportive atmosphere in full stands at the main track stadium with thousands throughout the meet, helped by pulsating music building to crescendos during each event. There was a buzz of excitement all around the meet when the NEW YORK TIMES ran a feature article and slideshow on the meet on the web and in the Sunday, August 16 Sunday print edition. The piece was titled, "Age-Defying Athletes": Photo-essay by photographer Angela Jimenez with over TEN photographs, and states, "Racing a Clock While Scoffing at Time at the World Masters Athletics Championships, Competitors in their 60's, 70's, and 80's gave new meaning to peak performance." The article led with descriptions and photos of American multi-eventer Flo Meiler and included Rita Hanscom, Christel Donley, as well as other world stars. Throughout the meet, the USA was in a pitched battle with Britain for third among the 98 teams in both golds and overall medals. At the end, they were essentially tied, with various relays and team event competitions still being tabulated. France and Germany were in a similar battle for first and second. 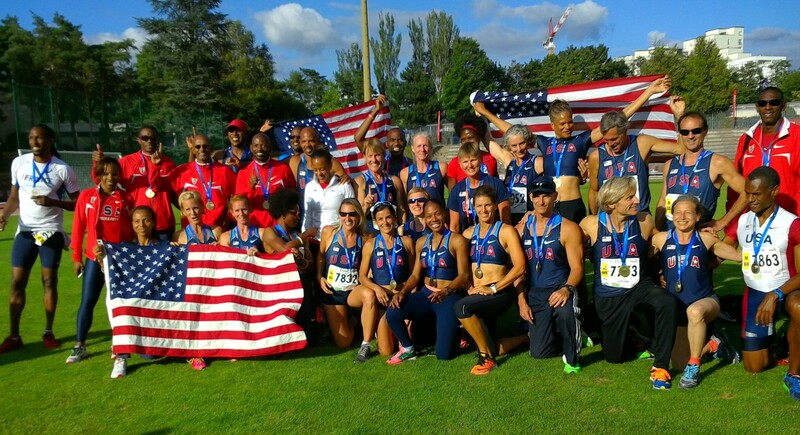 PHOTO: USA RELAY TEAM WINNERS, FINAL DAY, WORLD MASTERS CHAMPIONSHIPS --Photo: Mary Trotto.